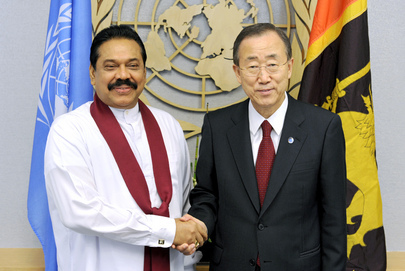 UNITED NATIONS, December 30 -- Responding to the Sri Lanka government's claims to the contrary, the UN insisted on December 30 that “it is NOT the case that the Panel would only talk to the LLRC,” President Mahinda Rajapaka's Lessons Learnt & Reconciliation Commission. 1) did or will the staff of the Panel go to Sri Lanka? 2) what agreements or understanding have been reached about with whom the Panel will speak in Sri Lanka? 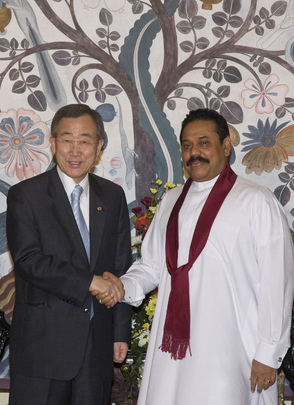 3) with whom in the Sri Lanka government did Ban or the UN speak before his Dec 17 announcement, talking into account that the External Affairs Minister Peiris later said he learn of it in the media? 4) why have you refused to answer these questions? On deadline. As I made clear to you at the time, the panel has not confirmed travel to Sri Lanka yet. The arrangements would need to be right. It is NOT the case that the panel would only talk to the LLRC. The panel made clear to me that their work is broader than simply dealing with the LLRC. That's all we have to say on it for now. Comparing this to Cabinet Spokesperson Minister Keheliya Rambukwella's reported statement about the visas and limits on the Panel, it seems that either the UN is belatedly standing up to the Rajapaksa government or that the UN doesn't read cited news reports, or both. Perhaps Cabinet Spokesperson Minister Keheliya Rambukwella is negotiating through public statements. Perhaps the Panel's staff is in or traveling to Sri Lanka to scope out a possible trip by the Panel -- which Ban Ki-moon announced as a fact on December 17. Was Ban Ki-moon himself only negotiating publicly with his December 17 statement? The four questions Inner City Press has asked are simple and should be answered. Watch this site.